Here are some questions and answers about the debate. 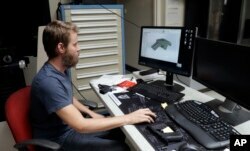 Ben Chalker shows the CAD software of a 3D-printable gun called the Liberator in Austin, Texas, Aug. 1, 2018. ​Q. Why does Wilson want the authority to post the designs on his website? ​Q. What kind of gun designs are available on the website? A. Defense Distributed shows a variety of designs. The code for a 3D-printed gun is for what he calls the Liberator, which gets its name from a pistol American forces used during World War II. 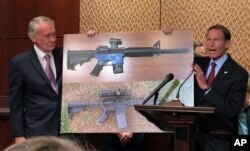 Sen. Edward Markey, D-Mass., left, and Sen. Richard Blumenthal, D-Ct., display a photo of a plastic gun on Capitol Hill in Washington, July 31, 2018. Democrats are calling on President Donald Trump to reverse an administration decision to allow a Texas company to make blueprints for a 3D-printed gun available online. Q. Are 3D-printed guns legal? A. In 1988, the U.S. enacted the Undetectable Firearms Act, making it illegal to manufacture, sell or possess a firearm that couldn't be detected by a metal detector. That law has been renewed several times by Congress and remains in effect. If 3D-printed guns contain enough metal to be flagged by a metal detector, they are considered legal under U.S. law. Gun-control advocates argue that the risks are too great to allow 3D-printed guns because even if they're designed to include metal, it's too easy for someone to not include those pieces or to remove them to skirt detection. Q. How well do 3D-printed guns work? A. Gun experts and enthusiasts recoil at the suggestion that a 3D-printed gun is a true threat, calling the firearms mere novelties.